WEAVE, in partnership with local refugee organizations strives to advance young girls and women’s status by providing them access to safe learning and educational spaces. WEAVE works with the Women Study Program (WSP) in Karenni Site 1 to build the capacity of Karenni young girls and women to learn a 10 months course on Women Issues and Development, Peace Education and Conflict Transformation and Community Development. These WSP students then extend community education and economic self-sufficiency projects to over 1,500 women in the refugee camp. In addition, WEAVE also collaborates with the Karenni Further Studies Program (KnFSP), a youth led education program in Karenni Site 2 that educates over 50 refugee students for 2 years. 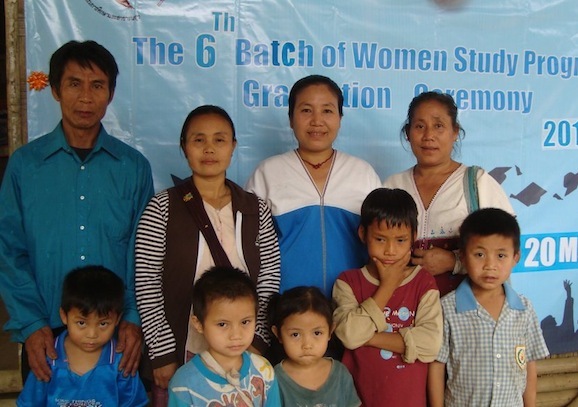 The picture below presents the KnFSP’s 4th graduation, with 18 graduates, of which 50% were young girls. “We have many courageous and inspirational women in WSP, including Mu Reh” said Naw Dina, WSP Officer: “Mu Reh, Kayah by ethnicity, never gave up her dream of completing her studies one day. She persisted and continued to persevere despite her many responsibilities as a mother, wife, daughter – making a living to support her family’s needs in the refugee camp. Last year, she approached me and said that she wanted to join the 10 months WSP course. She is one of the most active students and I am impressed with her determination to learn and to work for her community”. Mu Reh is 40 years old and did not manage to continue her high school because she got married. Taking care of her children and family placed a lot of strain on her. They were in constantly hiding and running while in Kayah State due to the human rights abuses perpetrated by the Burmese military. They settled in Karenni refugee camp1 few years back but they have to struggle had to make a living and add to the food given to them in the refugee camp. After graduation, Mu Reh will join WSP’s Women’s Livelihood Project where she will become one of the Community Development staff. Education opportunities are very scarce in the refugee camps, especially in availing higher education. The WSP and KnFSP serves as a safe learning and educational spaces for these refugee children. Despite the limitations in the refugee camps, both programs provide spaces for the students to be exposed and prepared to various possibilities once they graduate, such as pursuing an e-distance education or serve their respective communities as teachers, medics, community workers, to mention a few.